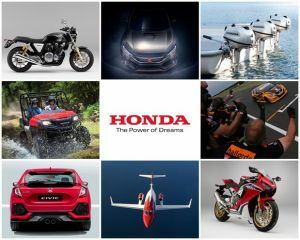 Honda UK is looking forward to a very busy 2017 which will see multiple product launches across the motorcycle, power product and the car ranges as well as two very important silver anniversaries. For the car division, 2017 will be the year of the Civic as the Swindon-built 10th generation will arrive in showrooms from March in a petrol version with the diesel version following, 2017 will also see the launch of the latest version of the iconic Civic Type R.
The launch of this latest Civic Type R comes as 2017 marks the 25th anniversary of the birth of the Type R badge. First seen on a NSX in 1992 in Japan and initially conceived for the race track, the Type R versions are special performance editions of the existing product line up and traditionally have a red Honda badge and Championship White paint as an option, as a tribute to their first winning F1 car. 2017 will also see Gordon ‘Flash’ Shedden start the season as triple champion alongside long time team mate Matt Neal in the championship winning Civic Type R. Having taken the crown this year, both drivers will be fiercely competing to make drivers’ championship number four come Brands Hatch in October. As well as the Type R milestone, 2017 marks the 25th anniversary of the birth of a Honda legend, a machine that redefined the super sports bike class. 2017 is the 25th anniversary of the launch of Fireblade. Continuing the quarter century of tradition that has informed every generation of Fireblade – the concept of Total Control – the new Fireblade delivers a 14% power to weight ratio improvement, gains a comprehensive electronics package and incorporates RC2123V-S, MotoGP technology. Honda’s British Superbike team will first ride the new Fireblade in anger at Donington in April. Then all eyes will be on the Isle of Man, in June, where Fireblade is the most successful 1000cc TT machine. With 23 wins to its name, to date, the ‘race bike for the road’ moniker has never been better suited. At the other end of the road-race scale, for those with more of a café-racer leaning, 2017 also sees the launch of the CB1100 EX and CB1100. CB1100 EX exudes classic style, with its stainless spoked wheels and short muffler. With a sharper geometry, wide, sporty tyres and lower bars, the CB1100RS delivers the hand-crafted style of its stablemate with a sporting edge.